Alexander Colville in Editor's Picks Film on 7 December, 2016. Halloween may be long gone and flurries of Christmas are in the air, but those nights aren’t getting any shorter. And Hollywood knows it. As we carry on descending into the darkness of winter, horror films we saw over the past few months often gnaw away at the back of our minds – a darkened upstairs landing at three in the morning can become a become a bit of a challenge. Although certain directors have cashed in on the close proximity of Halloween to Christmas and thus developed the niche genre of ‘festive-horror’ (Try ‘Black Christmas’ or last year’s blockbuster, ‘Krampus’) these films aren’t scary. Not really. It takes a lot to be frightened of baubles and a fat old man in red and white. Consequently, these films often end up being set on the only part of the festive season that can be made remotely ‘eerie’ – the dark of Christmas eve night. Even this seems a little forced. It’s hard to shake off the association with all the sleepless excitement and anticipation of the next day’s present bonanza, ingrained since we were able to write our first letter to Santa Claus. A sleepless night is not caused by horror, but by excitement. 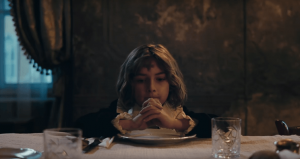 Nope, the season has never leant itself to gory horror – it’s a time for family films (preferably with a nice smug moral at the end), snuggling up with the relatives and putting something on that will keep the 6-year-old and the octogenarian happy. Christmas has ‘U’ written all over it. But there’s something strange about this. Christmas proves almost impossible to twist into Horror, yet is entirely focused around children and innocence – one of Horror’s staple themes. Not scared of that darkened upstairs landing I mentioned earlier? Well next time you walk along it, play a tune of a little girl slowly singing a nursery rhyme. Voila. The seeming innocence jars too much with what we are seeing and intensifies our unease. This child is now not what we think it is, but a façade for something unknown, and thus highly disturbing. Consequently, the horror genre is saturated with twisted childhood innocence – not only is Disney falling over itself to reshoot its classics with a dark twist (Think ‘Alice in Wonderland’ and ‘Maleficent’) but also ‘Rosemary’s Baby’ and ‘The Exorcist’ would not be possible if it wasn’t for the shivers we get at seeing a small angelic child reveal (literally) inner demons. 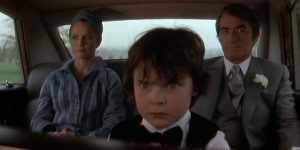 If you’re ready to forgive its rather dated death-scenes and melodramatic choices in music, ‘The Omen’ is universally held to be a cult classic. The story of one very quiet child from the spawn of Satan attempting to murder his way to power, getting by with a little help from his fiends (sorry). Child-actor Harvey Stephens (playing the demonic ‘Damien’) was chosen after the director Richard Donner made Stephens physically attack him during his audition. Stephens was the only child who tried to tear at Donner’s face and kick him in the groin. Which was a pass. You’ll never walk around a corner the same way again. Left alone in a snow-bound hotel during the off-season, the Torrance family start experiencing strange terrifying visions, driving Jack Nicholson to start chasing his wife and son with an axe. Son Danny often communicates to Tony ‘the little boy who lives in my mouth’ who replies with supernatural knowledge in a strange croaky voice. 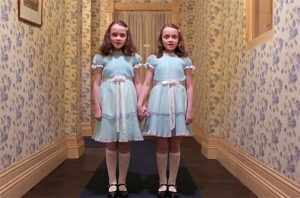 Thanks to Stanley Kubrick’s mastery of suspense and psychological terror, two little girls appearing at the end of a corridor asking you to ‘come and play’ with them become the stuff of nightmares. 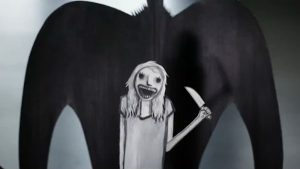 Armed with nothing but a picture book and a toy gun, cute son Samuel tries to keep ‘The Babadook’ – terrifying childhood menace in top hat (believe me it works) – away from mother Amelia, who being an adult of course doesn’t believe in such nonsense. The film plays around brilliantly with those who fear the dark. It begins at mother and son reading a picture-book that has the creepiest illustrations known to man (and this sampler isn’t even the worst of it). These images remain burned in our retinas during the rest of the films’ action, which happens in near total darkness, leaving our imaginations to do the rest. An especially spine-tingling moment occurs when a vast, shapeless mass of black silently drifts up toward the mother – recalling every childhood memory of bed-time when the light was turned off, and we started wondering if that hulking thing at the end of the bed really was just a chair. Not a ‘horror’ film as such, but certainly a thriller with a dark reality. It focuses on the boyhood of an American child, brought by his parents as part of a delegation to the Versailles peace conference of 1919. But don’t be fooled by those remarkably angelic features. Behind them lies the blackened soul of a fascist ‘leader’ of the future, with the film charting the boy’s first steps in learning how manipulation, aggression and violence can let you get your way. With an incredibly menacing score and subtle script, the film is a fascinating statement – that the greatest evils of our time can become manifest in the most unlikely of places. Even an angelic child at a peace conference. The knowledge that this rather innocent boy will one day become a political tyrant and possible mass-murderer makes us see his typically childish behaviour as the beginnings of latent evil. The period setting reminds the viewer of all the dictators who rose to power at this time, and what they may have been like as children. Of all the films discussed so far, this is the closest to reality – and therefore the most disturbing.